According to the 2016 Marine Corps Operating Concept (MOC), the greatest risk to the Marine Corps is that it becomes unbalanced in its development as a force that is at once naval, expeditionary, agile, and lethal.1 Four decades of institutional neglect of naval surface fire support (NSFS) has led to precisely that: the Corps is over-reliant on aviation and cruise missiles to provide fires in a non-permissive maritime domain. Without investment in NSFS solutions that balance capability and capacity, the Marine Corps will be constrained in its ability to maneuver at sea, leaving Marines ill-equipped to fight and win in the future operating environments the MOC predicts. The MOC makes it clear, though, that identified problems should be accompanied with feasible solutions: Marines innovate and adapt to win. By developing innovative tactics and munitions for the existing high mobility artillery rocket system (HIMARS) and by adapting the San Antonio-class amphibious transport docks (LPD) to support a naval gun, the Marine Corps can fulfill the MOC’s call for an agile, lethal, and expeditionary force with an ability to secure the sea control essential for the prosecution of naval campaigns. Moreover, new operational concepts may exacerbate the NSFS shortfall. The Navy’s answer to the proliferation of A2/AD weapon systems is known as distributed lethality (DL). The core thrust of DL is that the Navy seeks to strain an adversary’s ability to assess and act by “spreading the playing field.”16 As Admirals Rowden, Gumataotao, and Fanta state, “Distributed lethality is the condition gained by increasing the offensive power of individual components of the surface force and then employing them in dispersed offensive formations.”17 There is potential that disaggregation of surface groups will increase the geographic distance between the vessels expected to provide NSFS and the operating areas of Marines ashore. Even then, TLAMs are not necessarily the best or most economical solution to support maneuver units. The Department of the Navy states that a TLAM’s speed is roughly 550 mph.18 If a maneuver unit was conducting operations 30 nautical miles over the horizon, this would result in over three and a half minute time of flight, hardly ideal for troops in contact. TLAMs could be vulnerable to GPS spoofing or jamming, and could be engaged by adversaries’ point defense systems. The excessive cost would restrict the requesting unit’s ability to bracket a target or call for re-attacks in such events. If one uses $607,000 as a TLAM’s unit cost, the Navy expended over $121,400,000 of cruise missiles during the operation in Libya.19 This is hardly sustainable, which leaves the Mk-45 5-inch gun as the only current alternative NSFS capability. NSFS publications all too often end with gold plated solutions: the revival of the Iowa-class battleships, for example, or the fielding of a NSFS specific ship class, such as the Arsenal Ship.24 Yet, the MOC charges Marines to develop solutions that are technically feasible and institutionally affordable.25 While the thought of an un-mothballed USS New Jersey delivering a full nine-gun broadside is certainly patriotic, the operational requirements demand NSFS solutions that possess more range than what the venerated 16 inch guns can deliver.26 In “Bring Your Own Fires,” John Spang argues that the high mobility artillery rocket system/multiple launch rocket system (HIMARS/MLRS) is an ideal solution to the NSFS dilemma.27 The technology and the support procedures already exist. The trucks are purchased, the Marines trained, and the munitions proven in combat. The Marines should seize the current enthusiasm for military expansion by adding HIMARS battalions to the existing two. The HIMARS launcher carries two families of guided missiles: the guided multiple-launch rocket system (GMLRS) and the Army Tactical Missile System (ATACMS). 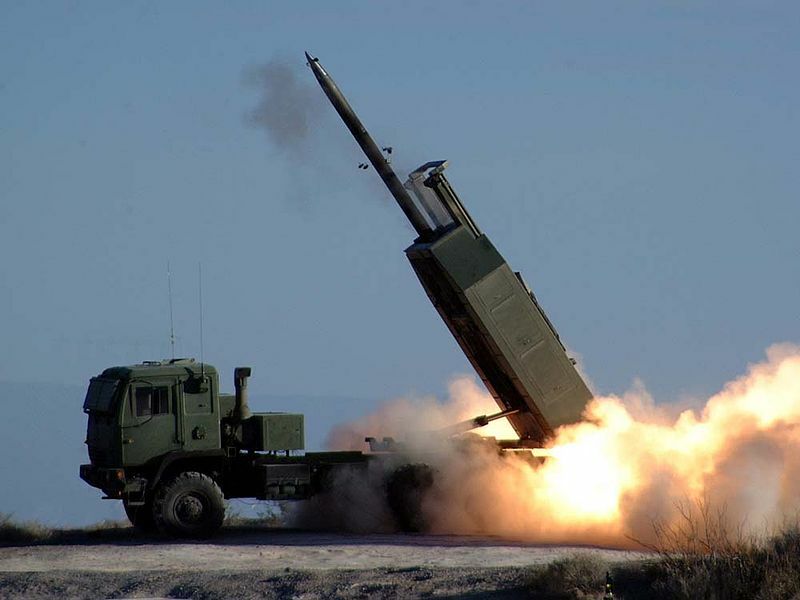 The GMLRS can strike targets at 48 nautical miles, while the ATACMs missile has the capability of launching a 500lb high explosive warhead 162 nautical miles.28 While the HIMARS is a road-mobile system, it has been fired at sea. In 1995, the Army successfully fired tactical ballistic missiles off the fantail of the USS Mount Vernon (LSD-39).29 This highlights not only technical feasibility, but a dramatic increase in warfighting potential. An embarked HIMARS converts any ship capable of handling the weight and the missile back blast into a NSFS platform. This dovetails almost perfectly into Admiral Fanta’s distributed lethality motto, “If it floats, it fights.”30 HIMARS systems and their rocket pods could be latched down to any vessel with a flight deck, weaponizing civilian, merchant marine vessels, or even auxiliaries such as the Expeditionary Transfer Dock or the Expeditionary Sea Base. When required to echelon ashore, the CH-53K could externally lift the launchers to support the ground scheme of maneuver, providing an additional return on investment in the form of operational tempo and initiative. It is even possible that HIMARS could be adapted for use as a NSFS module on a Littoral Combat Ship, provided the heat of the missile launch does not compromise the integrity of the aluminum hull. In light of the distributed lethality operational concept, the Navy is looking toward up-gunning the ‘gators.’37 Original designs of the San Antonio-class LPD called for two 8-cell Mk-41 VLS in the bow of the ship, but the cells were cut during development.38 Marine Commandant General Neller has expressed public enthusiasm for reversing this decision, stating that the addition of the VLS to the LPD would “change the game.”39 The addition of missiles would provide long-range fires to Amphibious Ready Groups or Marine Expeditionary Units, and support disaggregated, independent operations by the LPD. While the addition of 16 TLAMs would increase the LPDs’ lethal capability, it does not appreciably improve NSFS capacity, especially if the LPD is operating independently. The lack of a reload capability restricts tactical flexibility for fire support: the threshold to expend a TLAM would likely limit small, distributed units from exploiting gaps and seams as they develop. It also limits operational flexibility as the small magazine would prevent longer operations and limit time on station. Instead of installing a VLS into the LPD, the services should investigate the possibility of installing a naval gun. Quantity has a quality all of its own: guns provide a capacity that a 16 cell VLS does not. From an economic perspective, the use of a naval gun allows the Navy to invert the acquisition model from one centered on high-cost, low capacity missile purchases to a low cost, high-capacity gun system that will would enjoy better economy of scale.40 While the initial costs in ship modification may be more expensive when compared to the VLS, the price dynamics of a gun system are more favorable than TLAMs over the long term, especially given the tactical dividend of the gun’s ability to be reloaded indefinitely at sea. Counter-arguments to the retrofitting of the AGS-L into standing surface combatants exist. Studies would have to identify the effect of the gun on other naval systems, specifically the heat, vibration, and gases. Of most relevance is the ship’s superstructure: will the bridge’s fragility prohibit a gun entirely? While BAE promotional materials highlight the similarities of the physical dimensions between the Mk-45 and the AGS-L, careful attention would need to be paid to the extent at which the ship would have to be modified to support shell hoists, cooling, and magazine spaces. The back end logistics and life cycle maintenance would be an additional cost to consider. 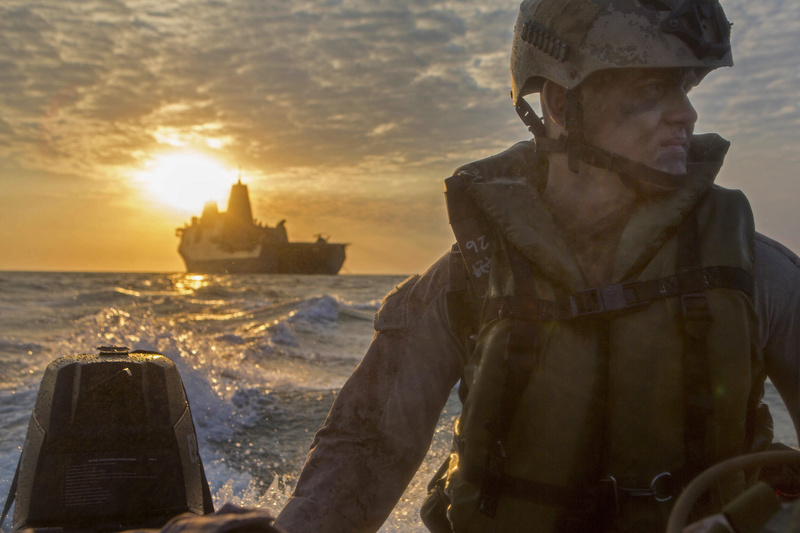 While these challenges are indeed daunting, the ability for an LPD to provide NSFS to the Marines already embarked would relieve other surface combatants and their magazines to prosecute other warfighting functions. An LPD is already better suited to provide NSFS because her engines and fuel supply allow for longer on-station times compared to cruisers or destroyers. On a personal level, the LPD crew providing fires to her previously embarked Marines could yield a familiar and habitual relationship between supporting and supported units, leading to increased combat effectiveness (and plenty of opportunities to practice processes while underway).49 Combined with her reduced radar cross-section, aviation space, and command and control capability, the LPD would be in a unique position to operate independently, supporting distributed operations across the maritime domain. If the MOC desires a force capable of securing sea control in order to support power projection in future operating environments, it must invest in NSFS solutions today. Imagine multiple, independently operating LPDs providing NSFS to distributed Advanced Expeditionary Bases armed to the teeth with ship-killing, low signature HIMARs detachments. The absence of capable NSFS threatens to yield a future Corps that is not only unbalanced, but possibly irrelevant. The most dangerous weapon in the world is a Marine and their rifle, a modern, usable, and cost-effective NSFS capability ensures they can get into the fight. Captain Vincent J. DePinto, USMC is an Intelligence Officer who served two tours in the Pacific. He holds a graduate degree from the National Intelligence University and is a student in the Naval War College’s Fleet Seminar Program. He can be reached at vindepinto@gmail.com. 1. Department of the Navy. The Marine Corps Operating Concept: How an Expeditionary Force Operates in the 21st Century. Washington, DC. Headquarters, United States Marine Corps, 2016. 4. Secretary of Defense. Annual Report to Congress: Military and Security Developments Involving the People’s Republic of China 2016. Arlington, Virginia : Department of Defense , 2016. 5. Sloman, Jesse, and Bryan Clark. Advancing Beyond the Beach: Amphibious Operations in an Era of Precision Weapons. Washington, D.C.: Center for Strategic and Budgetary Assessments, 2016. 6. Knepper, Greg and Singer, Peter. Short Legs Can’t Win Arms Races: Range Issues And New Threats To Aerial Refueling Put U.S. Strategy At Risk. May 20, 2016. https://warontherocks.com/2015/05/short-legs-cant-win-arms-races-range-issues-new-threats-aerial-refueling/ (accessed November 29, 2016). 9. Ron’ Rourke, Navy Virginia (SSN-774) Class Attack Submarine Procurement: Background and Issues for Congress, Congressional Research Service, October 25, 2016. 15. Rowden, Thomas, Peter Gumataotao, and Peter Fanta. “Distributed Lethality.” Proceedings Magazine, January 2015. 19. Reed, John. 2,000 Tomahawks Fired in Anger. August 4, 2011. http://defensetech.org/2011/08/04/2000-tomahawks-fired-in-anger/ Defense Tech. aspx (accessed November 10, 2016). 20. Joseph E. Santos and Andrew Stigler. “Littoral Combat Ship – A TKO for the Streetfighter,” A Case Study in Naval Force Planning, (Newport, R.I.: Naval War College, updated 2015). 22. LaGrone, Sam. Navy Planning on Not Buying More LRLAP Rounds for Zumwalt Class. November 07, 2016 . https://news.usni.org/2016/11/07/navy-planning-not-buying-lrlap-rounds (accessed November 14, 2016). 24. Duplessis, Brian. “Fixing Fires Afloat.” Marine Corps Gazette, 2015: 33-38. 25. Department of the Navy. 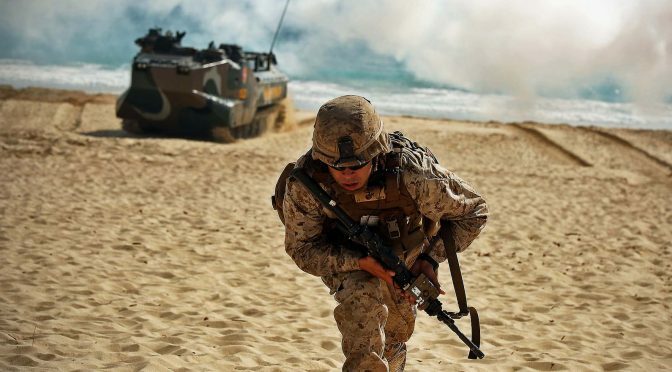 The Marine Corps Operating Concept: How an Expeditionary Force Operates in the 21st Century. Washington, DC. Headquarters, United States Marine Corps, 2016. 26. Spang, John. “Bring Your Own Fires.” Marine Corps Gazette, February 2011: 70-71. 29. Erwin, Sandra. Marines Clamor for Long Range Artillery at Sea. January 2002. http://www.nationaldefensemagazine.org/archive/2002/January/Pages/Marines_Clamor6864.aspx (accessed November 10, 2016). 30. Rowden, Thomas, Peter Gumataotao, and Peter Fanta. “Distributed Lethality.” Proceedings Magazine, January 2015. 31. Osborn, Kris. Emerging DOD ‘Cross Domain Fires’ Strategy: Army Will Attack Enemy Ships. November 25, 2016. http://www.scout.com/military/warrior/story/1687351-emerging-dod-strategy-cross-domain-fires (accessed November 29, 2016). 32. Department of the Navy. The Marine Corps Operating Concept: How an Expeditionary Force Operates in the 21st Century. Washington, DC. Headquarters, United States Marine Corps, 2016. 33. Jensen, Benjamin Back to the Future: Distributed Maritime Operations. April 9, 2015. http://warontherocks.com/2015/04/distributed-maritime-operations-an-emerging-paradigm/ (accessed November 10, 2016). 35. Holmes, James. Defend the First Island Chain. http://www.usni.org/magazines/proceedings/2014-04/defend-first-island-chain Proceedings Magazine, April 2014. 37. LaGrone, Sam. Navy, Marine Corps Considering Adding Vertical Launch System to San Antonio Amphibs. October 13, 2016. https://news.usni.org/2016/10/13/vertical-launch-system-san-antonio-amphibs (accessed November 14, 2016). 39. Harper, Jon Marine Corps Eyeing Additional Amphibious Ships. January 12, 2017 http://www.nationaldefensemagazine.org/blog/Lists/Posts/Post.aspx?ID=2394 (accessed January 27, 2017). 40. Cooper, Maxwell. “The Railgun Advantage.” Proceedings, 2011. 41. Weyer, Brent, and Al Panek. “The 155mm Advanced Gun System-Lite (AGS-L) for DDG-51 Flight III: A Summary of the BAE Systems IRAD Effort.” BAE Systems Land & Armaments. BAE Systems, May 15, 2012. 43. Kulshrestha, Dr S. Guns Remain in Navy’s Future Plans. 2014. http://www.spsnavalforces.com/story.asp?mid=33&id=3 (accessed November 14, 2016). 44. Mark Gunzinger, and Bryan Clark. Winning The Salvo Competition: Rebalancing America’s Air And Missile Defenses. Washington, D.C.: Center for Strategic and Budgetary Assessments, 2016. 48. Mark Gunzinger, and Bryan Clark. Winning The Salvo Competition: Rebalancing America’s Air And Missile Defenses. Washington, D.C.: Center for Strategic and Budgetary Assessments, 2016. 49. Duplessis, Brian. “Fixing Fires Afloat.” Marine Corps Gazette, 2015: 33-38.